Nationwide Bonus Drive - JD Auvil, Inc.
trade in is not one of these brands of vehicles. All qualifying Hyundai purchases and leases receive $500 except for any purchases made within the "Hyundai Circle" program; those buyers receive $100 back. $500.00 on all sedans August 27th through October 31st 2018. $250.00 on all SUV''s and trucks August 27th through October 31st 2018. To qualify for this cash offer, you must provide your proof of purchase that shows you did not trade in a vehicle made by Toyota, Scion or Lexus. If you did not trade in a vehicle, you must also provide a document showing current ownership of a vehicle not made by Toyota, Scion or Lexus. Example: your current proof of insurance of another branded vehicle. $250.00 on all SUV''s and trucks August 27th through October 31st 2018. $500.00 on all sedans August 27th through October 31st 2018. 1. Once you've found your perfect ride, visit any dealer to negotiate your purchase or lease as normal. 2. Return to nationwide.bonusdrive.com within 60 days and click on 'Get your check'. 3. Receive your check in the mail to spend on whatever you want! 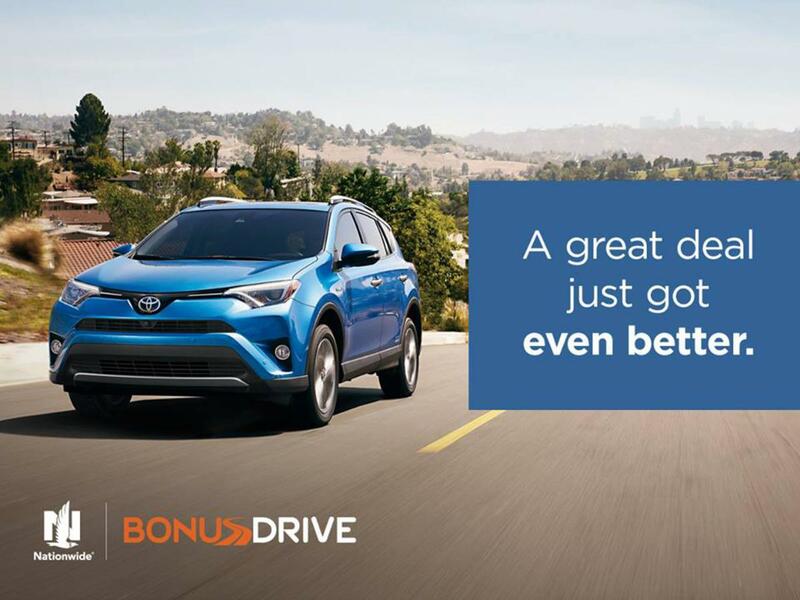 BonusDrive incentives apply only to the purchase or lease of new vehicles from participating auto manufacturers: Toyota, Chrysler, Dodge, Jeep®, Ram, Fiat® and Hyundai. Any vehicle previously sold, registered or titled is not eligible. Offer available on retail vehicle sales only. Not available for commercial or other fleet vehicles. Amounts may change from time to time and vary by vehicle brand/model, purchase date, and purchase type. Refer to Choose Your Perfect Ride for offer details. Applications must be submitted within 60 days of your vehicle purchase. Purchases of Toyota cars and sedans may qualify for $500 cash back. Purchases of Toyota trucks, crossovers, minivans, and SUVs may qualify for $250. Toyota purchases require either: 1) proof of a trade in of a vehicle other than a Toyota, Scion, or Lexus vehicle; or 2) proof of ownership of another vehicle within applicant household that is not a Toyota, Scion, or Lexus if the new vehicle was purchased without a trade in.Chrysler, Dodge, Jeep®, Ram and Fiat® purchases require trade in or proof of ownership within applicant household of a vehicle other than a Chrysler, Dodge, Jeep®, Ram or Fiat®. All qualified Hyundai purchases are eligible for $500 cash incentive except for any vehicle purchased under the “Hyundai Circle” program in which the total award is limited to $100. * No insurance purchase or quote is required; the buyer or lessee need not be a Nationwide insurance policyholder to take advantage of this offer. BonusDrive is the administrator of this program, and rebates are provided by the vehicle manufacturers. Nationwide is not involved in or responsible for the administration of the program or the provision of BonusDrive benefits. BonusDrive eligibility does not guarantee or affect eligibility for Nationwide insurance products. This is a limited time offer expiring March 31, 2019 and can be canceled at any time without notice. In cases where additional documentation is required for approval (i.e. proof of purchase), this must be submitted to BonusDrive within 14 calendar days of our initial request for this documentation. Approval is not guaranteed for any applicant. This incentive is only available on vehicles sold by dealers of listed automotive brands within the 50 United States of America and the District of Columbia. Vehicles purchased in Guam, Puerto Rico or other US territories are not eligible. Void where prohibited. See Terms and Conditions for other important information about the program. Program terms are subject to change.